The inaugural Windy City Horrorama Film Festival is taking over Chicago’s historic Davis Theater this weekend in what’s sure to become an annual must-attend event for fans of weird cinema in the city and beyond! The brainchild of writer/director/native Chicagoan Matt Storc (whose 2016 effort TAKE BACK THE KNIFE received nationwide distribution) and Alex Vazquez (a graduate of USC and the programmer behind Chicago International Film Festival’s “After Dark” series), the festival promises a weekend-long celebration of the DIY spirit of independent filmmaking, a party-like atmosphere, and an unforgettable 25th anniversary screening of Adam Marcus’ visionary re-imagining of the FRIDAY THE 13TH mythos, JASON GOES TO HELL: THE FINAL FRIDAY! Rue-Morgue sat down with the two programmers to discuss Midwestern niceness, what it takes to plan a fest, and which films you shouldn’t miss! Can you tell us a bit about how Windy City Horrorama came to be? Alex Vazquez: We’d been kicking around this idea forever, and I can’t recall what the trigger was, but I’ll always remember that we were sitting on my couch one day like eight or nine months ago, and we just put the flag in the ground, picked the date, and created a point of no return for ourselves. Matt Storc: We took it to the Davis Theater, because I was familiar with it, having grown up in Chicago. It was always in disrepair and falling apart, but when they re-opened after their recent renovation, it was like a whole new ball game. They really cleaned up the place and were hungry for content. I think it was just a case of being there at the right time! We had this crazy idea for a weekend-long Horror film festival, and at that point they weren’t really doing anything like that. They were instantly on board, and since that day have been behind us, supporting us, and promoting it. They’ve been very active and very good to us. AV: Very accommodating. They seemed very excited to bring in folks like us to do something a little bit different, and a little more community-minded. Speaking of community, why is Chicago the right place for something like this? MS: Chicago Horror fans are so devoted, and–as much as I don’t want to use such a boring word–they are nice. So much more than any other subculture, they are the nicest people you can deal with. And they’re passionate! They love this stuff! They love these screenings, they love when the directors come out, and they always have their stuff ready to be signed. When we announced that we were gonna do this, the response was amazing! That’s the reason why we do it, because the people are so good and passionate in this community. AV: I truly hadn’t seen a community like this. You know, in Los Angeles, everybody wants to come off like they’re industry-savvy. No one cares about that here. Everyone in Chicago is just like: “I love movies!” You know? There’s no mask obscuring what makes them happy or gets them excited! MS: Also, we hadn’t seen anything like what we’re trying to do in the city. Chicago has some great outlets to screen super low-budget/handmade backyard stuff, and then other great festivals that are doing nostalgia showings and higher-end, bigger-budgeted Horror stuff. There was no middle ground that pulled it all together and sort of cast a net to cover everything. Would you say that was your goal for this festival? MS: Yeah, there are so many different pockets of fans in Chicago, and I really hope that this is the festival that can bring them together. AV: Obviously, we’re on the same page with all of that. In a lot of the festival work that I do, it’s catered to an older, arthouse crowd that’s there to…digest something and feel enriched, like they went to a museum. Of course, there’s a place for that, but I do a lot of that. The real juice of it, the thing that really gets me going, is when I do a screening and I have a packed house of people that are just so ridiculously excited to see this weird little genre thing that I’ve found. I wanted to program something that was a little bit less concered with “arts and culture” in a stuffy, exclusionary sense and more arts and culture in a hanging-out-at-a-bar-drinking-beer-eating-junk-food-watching-something-that’s-just-so-fun-and-ridiculous-in-a-very-lizard-brain sense. I wanted to satisfy that urge and that part of me that sees movies as bringing people together in an experiential community way, as opposed to an academic way. That said, I think that both sort of live on equal planes and need equal attention from good curators. I also just wanted to throw a big party! MS: I do think that people will come out for this crazy weird stuff, but they’re also going to be surprised by how great these movies are. I think that’s a question we were asking ourselves from the beginning: How do we bridge that gap between having a really solid movie that “movie fans” can get behind, and how do we make this a party? I think we found the answer with the flicks we chose. Can you tell us how your 25th Anniversary Screening of JASON GOES TO HELL came together? 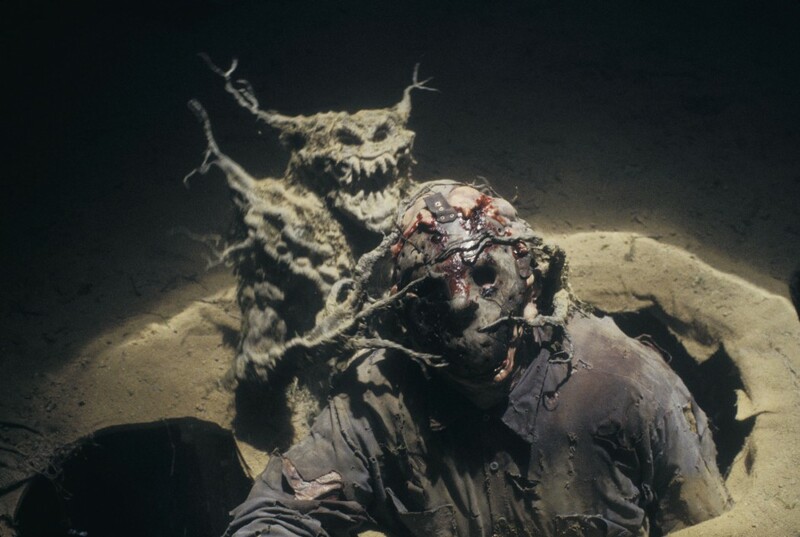 MS: And we thought, wouldn’t it be cool if we did a double feature with JASON GOES TO HELL, and he could be there all night, and it’s like an Adam Marcus party? So, we asked if we could possibly screen JASON with SECRET SANTA, and he said: “Oh, you guys need the Director’s Cut DCP? I have it, I’ll send it your way!” I was like, okay, now that you’re my best friend, we’re absolutely gonna make this happen, and you’ve gotta come! AV: Because you can’t get the Director’s Cut in High Definition! MS: The Blu-ray doesn’t even have the cut on it, but Adam offered that, and it was a dream come true! AV: Can we just talk for a moment about how it’s is such an underrated film? I came ready to defend JASON GOES TO HELL. Of course! It’s definitely one of the more divisive entries in the franchise. Have you always been fans? AV: When I watched it, I thought, “This is a Sam Raimi movie, it just happens to have Jason Voorhees in it.” You do get some great Kane Hodder action, and that diner scene is dope! There’s so much mayhem and goo and creative camera work…and it’s fun. It feels loose and uninhibited in a really surprising and contagious way. It invites you to have fun with this thing. It’s not so serious. MS: Yeah! In a way, we’re kind of tricking the audience by drawing them in with a FRIDAY THE 13TH movie and playing the weird one. However, once you’re sitting there, it is infectious. If you’ve got one person in the front that’s cheering and laughing along with the movie, suddenly you’ve got a room full of people doing the same thing. It’s going to be a blast! What has it been like coordinating with Adam Marcus? AV: In all of our discussions with him he’s nothing but candid, kind, and excited! He’s very honest about his work. He’s not precious about the things he’s made, so he’s kind of a craftsman in that regard. I think there are very few attending filmmakers who are as active on our social media as he is. He’s all in and ready to go! We’ll also have a party with him afterwards. After JASON, we’ll screen SECRET SANTA with Deborah Sullivan [his co-writer] and then we’ll migrate to Celtic Crown and have a bash, where you’ll pay a flat fee and have all you can drink for the night. Everyone who comes to the screening is invited! MS: You get to pick the brain of Adam Marcus while drinking non-stop! AV: I think it’s going to be a very unique experience! Major kudos to you guys for setting that up! What was the most challenging part of planning the festival? AV: It’s really been a fascinating test of mettle. I mean, there are a number of other people who, without their help, we wouldn’t have been able to get to the point we’re at now, but a lot of the time, it’s been Matt and I just sitting on a couch and figuring it out. MS: But it’s funny, because the easiest part of this, which was totally unexpected, was finding the movies and getting filmmakers interested, because all we had to do was ask! We thought a lot of the films we’re screening would be too big for us, but it was really just a matter of asking and staying on top of people. That was honestly one of biggest surprises and signs that this was working. AV: It taught us a lot about persistence and confidence, because we had nothing to lose! We learned to just be straightforward and tell them what we wanted. A lot of times, people just appreciate the fact that you’re being up front with them, and then they give you what you’re asking for. And, you know, filmmakers who work in Horror and B-movies are so open, enthusiastic, and oftentimes, just pumped that you found them. MS: Yeah, a lot of these films just…they wanna be seen! What contemporary films are you most excited about showing? AV: We have the world premiere of this movie, SOFT MATTER. Inexplicably we have the world premiere, because it’s so good. It’s an independent movie, through and through. It’s scrappy and handmade, but it’s well made. MS: We’ve really been trying to get the word out about it. You gotta trust us on this one. This is the one film that you have to come see, and come in blind! AV: I’m also really excited about our two films from Africa. One played at SXSW and is called NUMBER 37. It’s basically REAR WINDOW set in a present-day Johannesburg slum. It’s by a first-time, female director, and it’s super tense and so good! The other is a little bit more infamous, BAD BLACK, from Uganda, which won the audience award at Fantastic Fest about a year and a half ago. It’s kind of at the end of its festival run, but we thought it was important to show it, because a) it’s never been shown in Chicago, and b) the makers basically self-distribute. It’s such a taste of another culture, and a view of the way that culture sees movies. It just embodies that spirit of what we really wanted to celebrate with this festival: it’s DIY, it’s positive, it’s inclusive, it’s joyous, it’s ultra-violent, but it pulls you in and takes you to this different place that’s utterly unique, satisfying, and entertaining. So, I really hope people come out for those. What do you hope people take away from Windy City Horrorama? AV: Ditto. I want people to come in and discover a new favorite movie that they never would have seen otherwise, because that’s the joy in this thing. To make people happy and turn them on to something new. Any final things you’d like to say to anyone who might attend? MS: I would just say, take a chance on something you know nothing about! Don’t watch any trailers, just come out, see a cool Horror movie, and see where you fall on it. AV: Also like, we’re really cool, come hang out with us!